To be offered for sale by Silverstone Auctions at The Sale of British Marques 2019, Chipping Norton on 11th May 2019 starting at 2pm. Guide price: £40000 - £50000. * Chassis number One * 17,100 miles, covering just 1,400 miles in the last 12 years * As tested in period by Richard Hammond (See YouTube - Richard Hammond Exige) * Very special, right-hand drive, Series I Exige fitted with 190 bhp Rover K-series * The Series 1 Exige is not a common sight on UK roads, only around 100 exist today Despite the fact that it enjoyed critical acclaim, the Series 1 Exige is not a common sight on UK roads. Reportedly 604 were built between 2000-2001 and of those 177 were left-hand drive. Track day attrition and over exuberance have reduced these numbers significantly so it appears that only around 100 exist today. A lot of these cars were modified in certain ways including engine transplants so finding cars that are totally original, has become difficult.This is a very special, right-hand drive, Series I Exige, in fact, its the very first Exige to roll off the production line. Its first owner, Lotus Cars, used the car on various press duties, and it can be seen on YouTube being driven by Richard Hammond and has also been featured in various car magazines such as Evo and Autocar.Finished in the distinctive colour of Chrome Orange, and fitted with the more desirable 190bhp VHPD version of the Rover K series, chassis #1 has covered a total of just 17,000 miles, less than 2,000 since 2007. 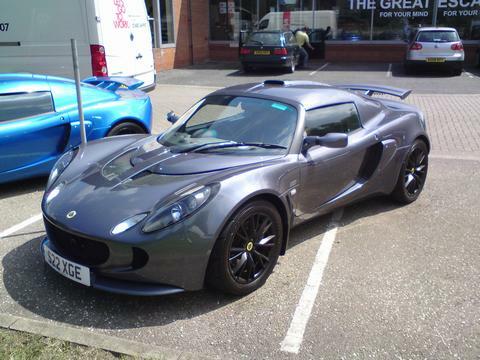 #1 has had three former owners, Lotus cars, actor - Scott Wright (Coronation St, Shameless and Emmerdale), and one other private individual before passing into the hands of the current Exige aficionado and serial collector. Included in #1s history file are many invoices showing that periodic services have been completed by Lotus cars and Lotus dealerships in its early days, but later switching to marque specialists. Factory extras included, Alcantara racing seats with Exige embossed headrests, 4-point Safety Devices harnesses, and a carbon fibre airbox. In April 2019 the present owner fitted a set of four new Yokohama AD08R tyres and we are informed by the vendor that the car will be MOT'd prior to the sale.A true British collectors classic, but will the new owner decide to store it carefully or will the temptation to take #1 for a blast early on a Sunday morning prove too much to bear?